I was recently able to pick up a very cheap copy of Scott McCloud's Zot: The Complete Black and White Collection: 1987–1991. (It was going for the price of a modern single issue, so I figured 500+ pages is a good deal.) I didn't really expect much. 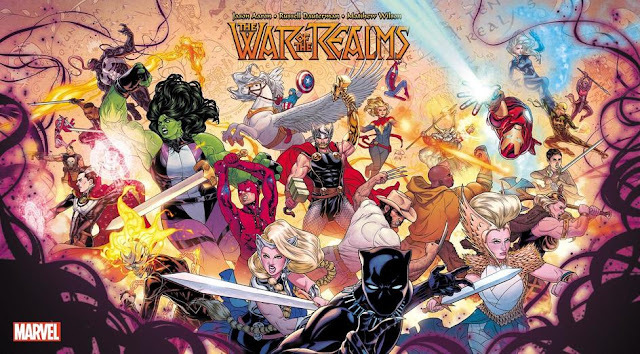 I like McCloud's theoretical books on comics (Understanding Comics, Making Comics, and the first half of Reinventing Comics), but all the fiction I've read that he's done has been on his website, where he's more likely to focus on finding new applications for the digital platform than telling a straightforward story. And besides, this is before he wrote all those books, and by his own admission in the introduction, he hadn't learned the lessons that he'd put into those books yet. Zot! is about a teenage superhero named Zachary, or Zot, who lives on a different planet, one that's also called Earth but is futuristic and generally peaceful. He finds a portal to our world where he meets another teenager named Jenny. They go back and forth between their two worlds and get into adventures. To say there are cultural differences between them is an understatement. The book I picked up is in black and white and starts 11 issues into the run, since the first 10 were in color. Nevertheless, I had no problem picking up on what was going on in the story. So, long story short: I liked it a lot. 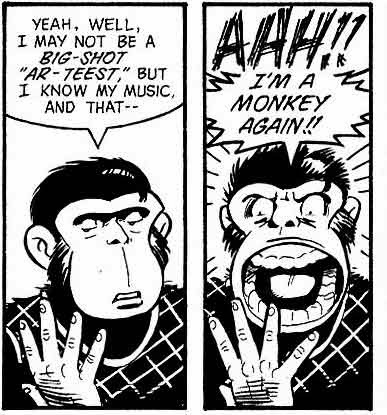 I generally like the way Scott McCloud draws, but his default, minimal style really heightens the impact when he decides to draw on his influences, and those influences are various. 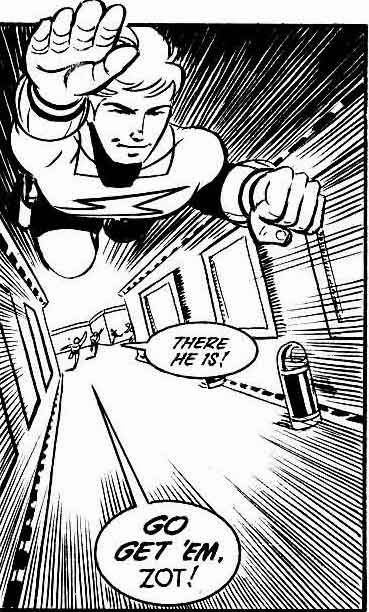 First off, Zot's a superhero, and he wears a red shirt with a lightning bolt on his chest, so he's all up for awesome splash pages and flying around! But McCloud's also a big proponent of manga and one of the earliest guys to incorporate manga into American comics, and one of the influences behind Zot! 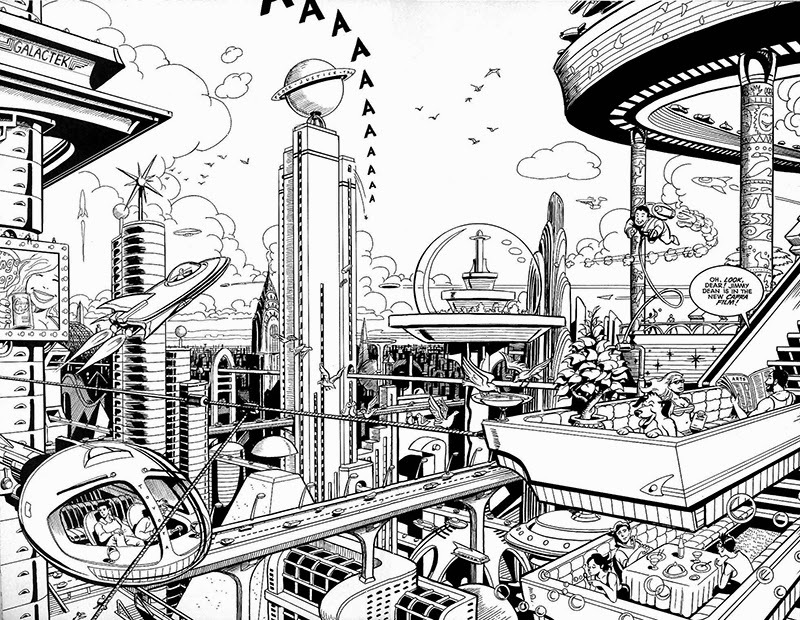 is Osamu Tezuka's Astro Boy, which I think you can see in that image above. But it's also evident in how Zot's movements are depicted. McCloud uses "subjective motion" — that is, to hold the figure static while putting the speed lines on background elements — to make it feel like we're riding with Zot, as opposed to the then-conventional way of just putting speed and motion lines behind the figure, which gives a bit more of a spectator feel. This type of thing is one of the first manga tricks Western artists appropriated, and also the first manga trick I remember thinking I liked a lot. I've been half-heartedly trying to get into manga for a while and haven't really been feeling it (to be fair, I've been avoiding anything that makes it look like I'd have to buy more than one volume, which is most of that particular industry), so it's nice to see a bit of crossover here. I think the black and white makes me appreciate that influence more. I always appreciate a well-rendered, well-drawn environment. Not that there's got to be a lot of noodling for me to appreciate it. 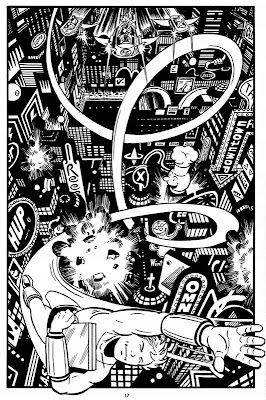 Here's a spread of Zot's world. Of course, McCloud was an independent artist back in the 80s, and that meant a lot of experimental art came his way. With the robotic villain Dekko, who saw the world very differently, he was able to work in some of that stuff. It's a visual treat in addition to Dekko just being a fascinating villain who is legitimately crazy and threatening. But where I was really impressed was with all the quiet moments, the moments that took place on "our" Earth, the mundane moments. I don't think it's a stretch to say that I've never been the biggest fan of the more grounded and emotion-based indie work. There are exceptions (I love Good-Bye Chunky Rice, for example), but they for the most part still need an element of fantasy or magical realism to really hook me. Love and Rockets is well drawn but doesn't work for me (and it just makes me want to read Archie Comics, to be honest); I think Strangers in Paradise is overwrought and too soap operatic; Dan Clowes' work always makes me want to look at it and turns me off a few pages in; Chris Ware's stuff always makes me want to praise him for the art, and that's about it. 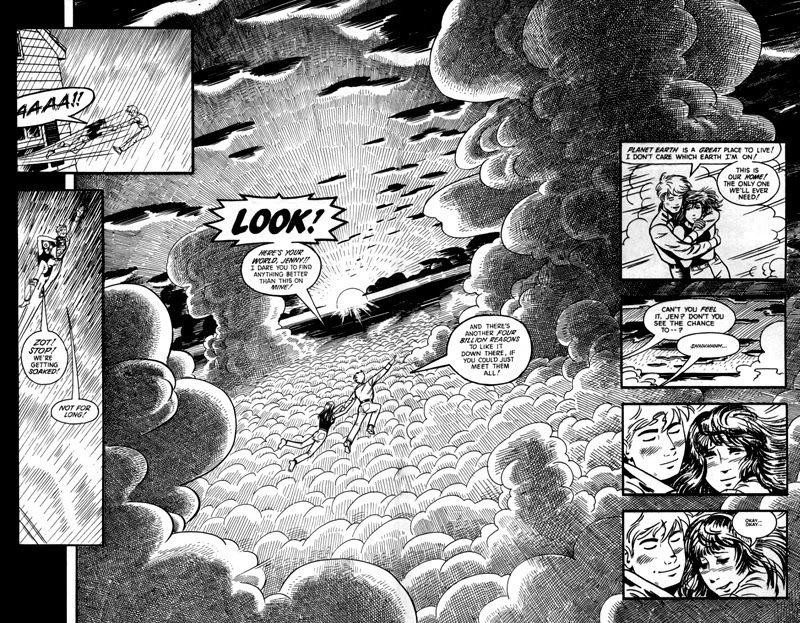 With Zot!, because of the natural disparity between Zot's and Jenny's worlds, McCloud can have the best of both the superhero and down-to-earth genres, and because it's still, at the end, a superhero comic, there is a feeling of hope that I generally find absent in most creator-owned work I look at in the latter genre. In other words, it may show the hardships and depression of everyday life, but it is balanced out. Disclaimer: The last two paragraphs aren't a condemnation of that genre. It just doesn't work for me in heavy doses. 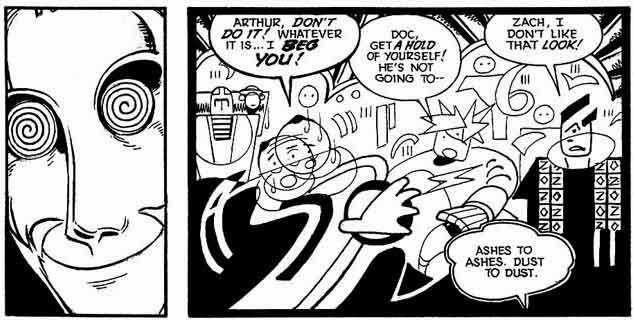 So color me impressed when I see McCloud doing really subtle things with hand gestures and facial expressions, as we see Jenny do the first time Zot decides he needs some time away from out Earth. 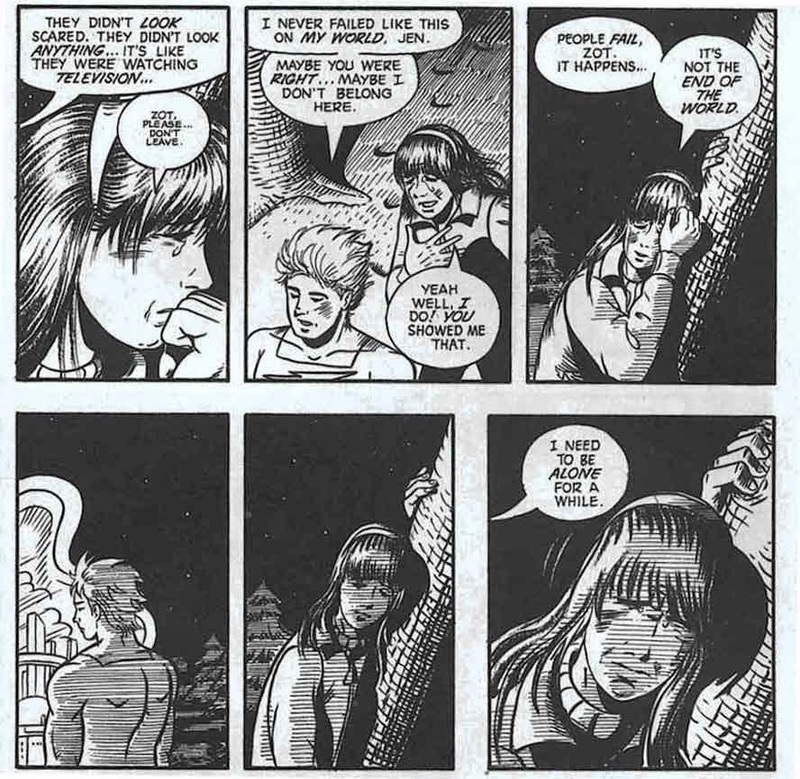 And the best example would be in the issue entitled "Normal," where Jenny's best friend, Terry, comes to realize that she's a lesbian, and is trying to hide it from everyone. Naturally, Zot can tell. Terry's reluctance to say anything comes from the fact that a gay schoolmate of theirs was bullied and crippled for life. That last panel is really good. McCloud can talk about not really being a good draftsman all he wants, but I disagree, and even if he doesn't have the best figure work, the pacing and blocking of his shots, as well as the body language of the figures, say it all for me. McCloud said that the central theme of the book was hope vs. disillusionment, and because it's Zot's book, hope should win out. I like that. The contrast really highlighted the differences between the characters and the two different Earths, and made smaller moments more powerful. Between a technological utopia and the real world, a protagonist incapable of feeling angst and a supporting cast whose default mode seems to be that, simplistic-looking figures and elaborate environments, straightforward storytelling and experimental work, and Western and Eastern influences alike, it's possible that Zot! can serve as a global encapsulation the comic book medium. All it's missing is funny animals. Featured In: Duy, Scott McCloud, Zot! It may be because I read it right after, but to me Zot! read like a companion to Understanding Comics, even though Zot came first, it still felt like it was someone showing you all the stuff you can do with a comic. Here's ten issues in color, here's some in b&w, here's american comics, here's japanese, here's a drama story, here's a comedy, here are some cool panel and page layouts. 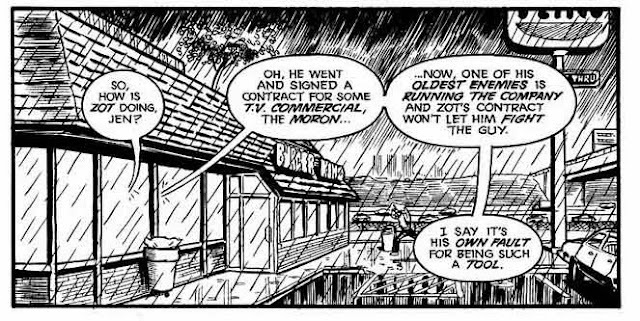 You can tell he had a lot of thoughts about comics as a medium while making Zot! too. Uzumaki by Junji Ito has come out in a complete edition. One of my all-time favorite comics, and my favorite horror comic (heck, my favorite horror story) bar none. It's just a beautiful piece of work. I just read Garden by Yuichi Yokoyama, a surreal and wonderful story about some weird men exploring a weird man-made garden. As far as I can tell, all of Yokoyama's books are standalone, so you should be able to pick up any one of them and have a great experience! There's also Yoshihiro Tatsumi, his short story collections are really great. Check out The Push Man and other stories. Thanks for those recommendations! I'll look into 'em!